My career of traveling over the snow, for pleasure and work, has given me the most enjoyable memories of my life as well as the most tragic. As an avalanche forecaster I predict avalanches, a difficult, and at times seemingly impossible task. Avalanches are beautiful, raw and powerful, and over three decades they revealed lessons, not just about snow, but about life. Every snowstorm is unique and every avalanche its own creation. There are times when it is necessary to study the complexities of snow: it’s layers, crystal types, and density. Yet in order to travel safely in the wintery mountains we must also understand simple, and often overlooked principals about terrain, weather, and obvious messages Mother Nature leaves for us. The power of observation, communication and action are essential skills that have kept me alive and moving forward. 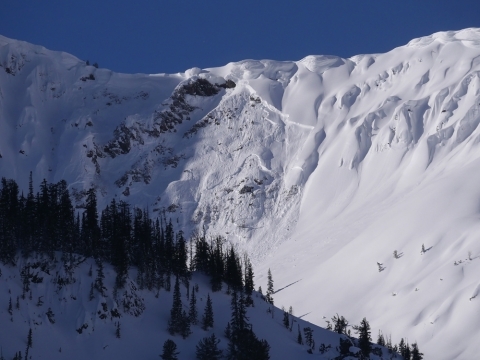 More snow means more avalanches and recent avalanches are the number one sign that nearby slopes are dangerous. I know this. 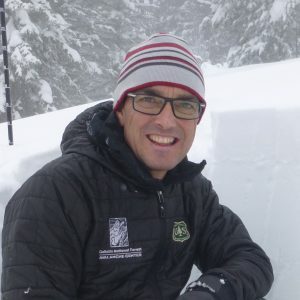 Yet, after 20 years of working as an avalanche forecaster with the USFS I was in the middle of a steep slope, skis off and digging a hole in the snow to determine the avalanche danger in a raging snowstorm after seeing large avalanches the day before. It was 2003 and I was high in the Beartooth Range north of Cooke City. My partner watched from a safe location 100 feet away. With wind whipping I dug down to discover I was standing at top of a slope where an avalanche released the night before. I felt with my shovel a vertical crown line marking the upper edge of the slide. I was excited to see this, as I usually am with avalanches, and in my excitement I let my guard down. I yelled, “Scott! Come on over here and check this out. This slope already avalanched.” Scott skied over and we settled into our routine of shoveling, squaring snowpit walls and taking notes. Ten minutes later, as we both stooped in the snowpit, skis and packs off, the entire slope shook and cracked with a loud “whumph”. We jerked ourselves upright, suddenly aware that we were fully unprepared and about to be engulfed in an avalanche. We would both be caught with no one to rescue us and were going to die. Avalanches are beautiful, scary and incredibly fun to trigger from the safety of a ridgeline. A single, puny jump is sometimes all it takes to collapse and break a weak layer and release tons of snow. One never forgets seeing a crack shoot across a slope and shatter the snowpack as it accelerates out of view, shaking and breaking trees along the way. Imagine kicking the side of a 10-story building and watching it crumble to the ground. I wish I could report that after the 2003 incident I no longer made simple errors, but that is not the case. The Beartooth Range has given me ample lessons, some I swore I had mastered. A year later I was near the top of a 50 foot wide avalanche path bordered by white bark pines. This day was not unusual. It was snowing and blowing and the avalanche danger was obviously rising. A layer of weak, unsupportable snow was buried three feet deep and I wanted to see how unstable it was. I dug down and found it stronger than I anticipated. I tested it again and got another stable result and decided we could safely ski the slope. When my partner clicked into his bindings we heard a heart-stopping “whumph” as the slope avalanched at his feet, three feet deep. He almost fell off the crown. It was unbelievably frightening to see the slide break trees and not stop for a thousand feet. My decision to ski was wildly wrong and once again I was given a free lesson by Mother Nature. I was led astray by stable test results. I knew the avalanche danger was rising from new snow and wind-loading. I was complacent and lazy in critical thinking. I even proclaimed that this slope would probably slide a few hours after it got more snow, but at this moment it was fine. What a crock. I treated my guess as irrefutable fact. Luck and digging our snowpit a few feet above the steepest part of the slope in lower-angled terrain, a life-saving practice, kept us alive. There’s no sense digging a pit in avalanche terrain if it can be avoided. These near-misses were not the only ones in my life. I cut things close when I was young, and not just as an avalanche forecaster. I believed I was smart, fast, bold, and experienced beyond my years, when in reality I was lucky to survive dumb mistakes that killed others. I confused luck with skill. I have climbed technical lines on big peaks around the world and luck was in my corner on many occasions. I survived anchor failure, crevasse falls, rockfall, being trapped by storms and running out of food and fuel. I emerged a little wiser in spite of myself. Luck has a hand in keeping us alive. In my job I have consoled wives, parents and children when their loved ones perish in an avalanche and the circumstances of their death makes no sense. A few years ago a skier triggered a slide, tumbled 2,000 feet down a chute, over cliffs and through tress and emerged unburied with only a broken arm. Another person was buried in a small avalanche and uncovered in minutes, yet could not be revived. Yet another person was buried under nine feet of snow for 30 minutes and dug out alive and uninjured, a miracle of sorts. Anyone caught in an avalanche has made a grave error and lost complete control of the situation. All they can do is fight and hope it is their lucky day. Snow, like each person who plays and works in it, is complicated. Every storm leaves a different, unique layer, some strong, some weak. Some can hold a lot of weight as they get buried, others break easily. The type of snow crystal, density of snowfall, air temperature and humidity, wind, longwave radiation loss and cloud cover are a few of the factors determining what type of snow falls and how it will change on the ground. As a snow scientist I try to anticipate whether snow metamorphism will make slopes more or less stable in the days and weeks to come. I hunt for instability and try to investigate the weakest part of a slope. It’s important to look closely at the snow and gather data, so I poke and probe with thermometers, density tubes, and a crystal card and powerful monocular to look at individual snow grains. I perform stability tests and look for obvious signs like cracking, collapsing or recent avalanches. The more I know about the snowpack the better I understand the future avalanche potential. Our snowpit is a mini scientific lab, but we don’t live in labs. People do not die because they failed to measure the snow temperature properly or misidentified a snow crystal. Most of the time people die and have close calls because they missed the basics. They rushed things and did not pay attention to the details (“It snowed how much?”). They cut corners and didn’t see Mother Nature’s clues. They listened only to themselves, failing to embrace the bumper sticker wisdom of “Don’t believe everything you think”. Lessons from the snow as it is and not how I want it to be are the same as seeing the world as it is instead of how I want it to be. It’s hard to make good decisions with blind spots, which we all have. That’s where a good partner comes in. An objective friend can point out hard truths and ask uncomfortable questions, helping both partners avert disaster. Avalanches require snow, and snow requires precipitable moisture and cold temperatures. When I first started my career it rarely rained in winter. Now, at least one rainstorm, sometimes more, happen every season. Even during the historic 2017-18 winter when close to 60 feet of snow fell in the Beartooths, there was rain. Whiplashing temperature swings have become normal. Climate is changing fast. Climatologists are predicting bigger and more rapid swings in temperature and precipitation. Snowfall distribution is changing with new records being set almost yearly for drought and snowfall. As an avalanche forecaster these issues are deeper than just the inconvenience of wearing a rain slicker. The evidence, felt locally, is part of global climate change. There are serious avalanche considerations with a changing climate because rain weakens snow, big temperature swings create weak layers, prolonged periods of dry weather followed by large snowstorms make widespread avalanches and our acquired knowledge from the past needs continuous reevaluation. I never imagined I would make a career of studying avalanches. I grew up in New Jersey. My adventures as a boy entailed building forts and playing army in the “woods” near my home. Bordering the Turnpike were a couple acres of trees, brush, garbage and high-tension powerlines buzzing overhead but in these woods I imagined I was self-sufficient, battling wild nature, testing my Daniel Boone toughness. As a freshman in high school everyone took a career personality test. Mine listed Park Ranger at the top which caused laughter and ribbing from my family because we didn’t know what one was. Yet, that personality test was more accurate than not. Six years later, after my junior year at Prescott College in Arizona, I landed my first outdoor job as an assistant leader hiking and camping with high-schoolers in the Absaroka-Beartooth Wilderness. It was my first trip to Montana and my first wilderness experience. I was in awe. Over a couple weeks we traversed the plateau, fished, camped, and drank up the beauty, vastness and solitude. My life was forever changed. As soon as I graduated I moved to Bozeman to be a ski patroller in winter and climbing guide in summer, forming a foundation to become an avalanche forecaster. I have learned many lessons by trial and error, good partners and being lucky. Scott and I never looked at the snow the same after our close call. We named that slope “Almost Died” so we would not forget. Other hard truths were especially helpful for life outside of snow where a good partner can save your life. One should not confuse luck with skill, and never, ever, believe everything you think.